Hunger — in the form of each hungry person we meet — literally stops at The Salvation Army’s doors . . . in our own community and around the world, every day of every week of every month of every year. Hunger stops here. 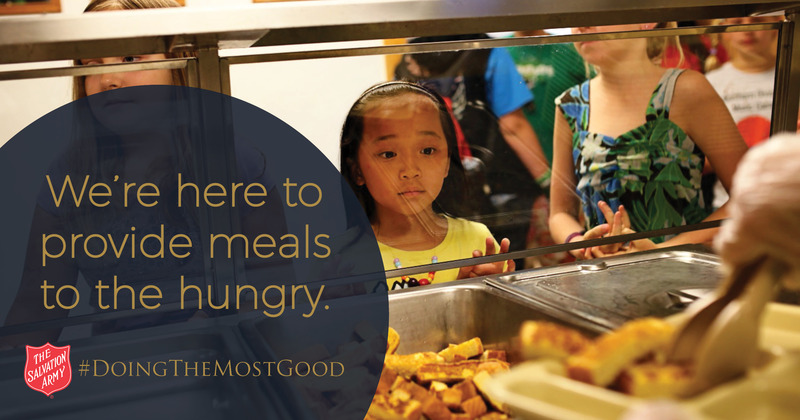 Last year, The Salvation Army Empire State Division provided over 825,000 meals to people in need. These meals assisted low-income individuals and families struggling to make ends meet throughout Upstate New York. When people need somewhere to turn for food, The Salvation Army is there. Food pantries assist families and individuals with groceries to prepare in their home. Families can stretch their funds for the month by stopping at a food pantry. When individuals come into a food pantry, a caseworker meets with them and talks about how their resources are being distributed. Qualification for the food pantry is based on need. The amount of food varies by family size. Each pantry tries to provide nutritionally balanced meals. Throughout the year, The Salvation Army is there to provide a warm meal and comfort to those in need to help them get back on their feet. report the inability to afford enough food.